Nike's latest outdoor campaign features huge pictures of various Nike athletes, but also include their Twitter handles (individual addresses) and a hashtag #makeitcount. 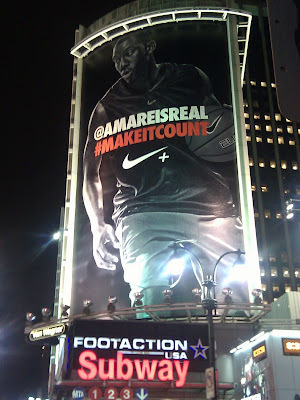 The New York Knicks' Amar'e Stoudemire (aka Renaissance Man) features in this Nike Twitter poster, with the only words on the poster being the '@amareisreal' Twitter address and the Twitter hashtag #makeitcount. but the Nike Twitter posters are (arguably) the most prominent promotion of individual Twitter handles (Paid drives Owned) and a Twitter hashtag (Paid drives Earned) to date. This shoes' ads has been making a large fuzz in the market. We, at the search engine optimisation company observed how well their ads and marketing schemes are because they're visible and active in any form of marketing. Those look like what most long island advertising agencies are doing these days. It's a really effective method of marketing. You could likewise contact via e-mail at the e-mail address given. DIRECTV Now Make certain that you have you inspecting account number or credit, debit card. 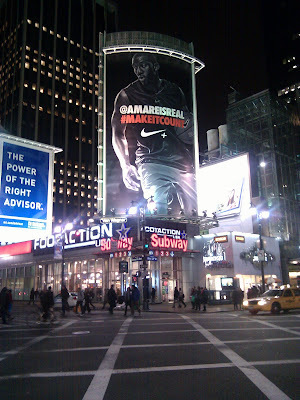 Nike products always impress me.